Jazz singer and songwriter Diane Nalini started singing at the age of three and never stopped. Born in Montreal to Belgian and Goan parents, she sings and writes songs in four languages (English, French, Portuguese and Spanish). Her multilingual repertoire draws from her lifelong passion for jazz, French Chanson, Brazilian popular song, and great literature. “She captures jazz at its most sophisticated and joyous level,” writes Elle Magazine Canada. “I just love Diane Nalini’s voice. 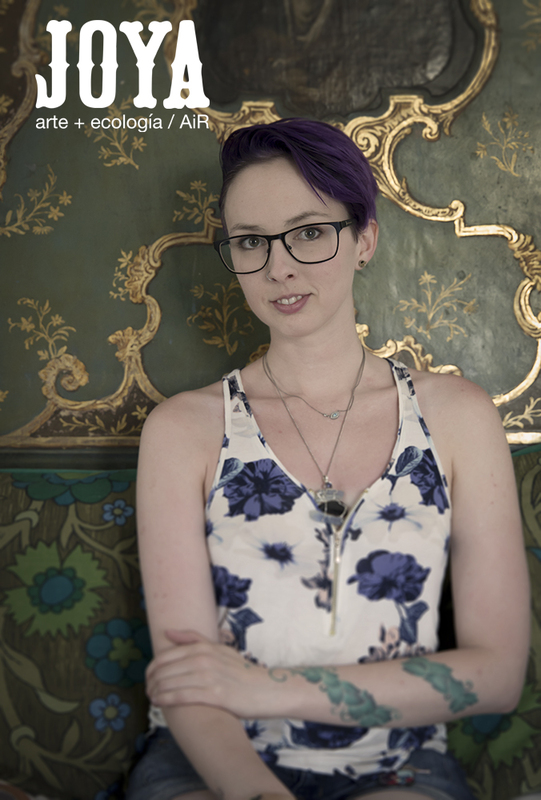 This is a sassy, ‘ripe plum in the Italian sun’ kind of voice… She has such sweet and effortless pitch, it’s beautiful.” (Katie Malloch, former host of CBC radio’s Jazzbeat and Tonic). ‘The journey to Joya: AiR was a compliment to my current projects in ways I only experienced once my time with Simon and Donna was over. This is to say, like all things beautiful and rare, only its absence can its true worth be felt. And absence describes Joya: AiR egregiously well. There is an absence of all the distractions we seek to escape from, as artists trapped in the mundane. The absence of noise, of clutter, of unwanted human contact. There is no water to be wasted, and hardly any shade to take for granted. In removing all I sought to shed myself of, I found my heart and mind stripped to their bare, dry innards. Excuses and distractions dried up in much the same way the sun pulled up water from the arid ground on which I stood for a week. I was left with nothing except wide, wide space. Joya: AiR is filled with seemingly quiet space. The people around me, busy at work with creative projects of their own, created within Joya: AiR an air of manifestation; unconsciously, sitting or walking anywhere, you know something is being made. Passion for making and creating burns at Joya: AiR. It’s in the kitchen and the art studio, in the bedrooms and the gardens. It’s on the hilltops where we sit to talk and watch sunsets, and growing slowly in the hulls of almond seeds on trees stretching upward and onward over sprawling hillsides. Even the solitude breeds something new; connection. I met the most inspiring people during my stay, and heard stories from which I’m branded. I’m bringing home the scent of rosemary and dirt, and memories of lovingly crafted meals and conversations. I carry with me new blossoms of things which grew in the spaces emptied by the Spanish sun and strong mountain winds. From Joya: AiR, I sought an absence of all things which held me back from creating, and found myself drowning in everything newly growing inside. All I needed was wide space to soak up the sun, and grow. ‘During my short week at Joya, I met incredible people and had fabulous food. Each day, Simon and Donna were more and more welcoming. Because of their openness and availability, I was able to concentrate on my curatorial research. 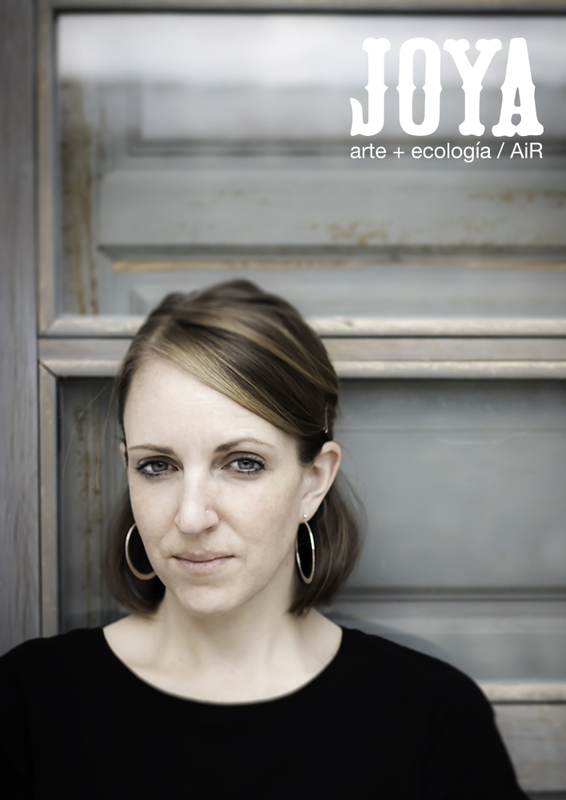 Just like my current project, Joya: AiR is guided in the landscape and its ecology is a constant inspiration. I feel privileged to have been part of this family even for such a short week’. design and have begun to dedicate myself fully to developing my practice as an artist. Since then, I have never felt more fulfilled and passionate. During my time at Joya: AiR, I created a series of installations and sculptures that examine the nature of human perception. My installations incorporated sensory elements such as sound, smell, one’s relationship with space, and the experience of time. Through my project, I created shared emotional experiences between myself and the various members of the residency community. Having a background in design and craft, my goal was to integrate the principals of both processes in my practice. Empathy and continual iterations are essential elements of the Design Thinking process which I will focus on. I will closely examine the relationship that is formed between my work and those who experience it. I believe that the process of creating a piece is integral to my understanding of the subject matter of my work. My time at Joya: AiR has resulted in a comprehensive body of work that will serve as a jumping off point for further pieces to come’. “The first night I passed at Joya: AiR was filled with strange noises coming from the wood burning stove next to the wall of my bedroom. It felt like rocks hitting metal panels. I learned the next morning there was a bird caught into the chimney trying to get out. In fact, two birds were trapped in the house: one in the kitchen and one near my bedroom. As I came here for residency having in mind sculpting birds, I felt it like a sign. The next day, Simon (director and co-founder of Joya: arte + ecología) opened the door of the stove and a window nearby. By chance, I happened to be standing in the other room, just as the bird took his opportunity and I saw it fly away through the open window. I can say that by that moment, I found my point of reference both externally and internally. I understood why I had these images of birds trying to emerge from my subconscious: they were a metaphorical image of our human condition. Trapped in our lives, we may sometimes need somebody – or something – to open up our inside door. As the days passed, I have been walking a lot throughout the land and the only other living creatures I have crossed were.. birds. As they were the subject of the project I now had in mind, I felt a deep connexion with the environment. Finding a lot of branches quite expressive and being inspired by them, I started to work on a series of sculptures mixing human torsos with bird heads in the objective to assemble them together. The wood here has gained a rich density of organic forms due to the harsh living conditions of growing in constant search for water. With the clay taken from the surroundings, I have sculpted figurines halfway between birds and humans. The clay, being full of little rocks and impurities, has given to my sculptures a primitive quality but more complex, expressing a link to this untamed territory. 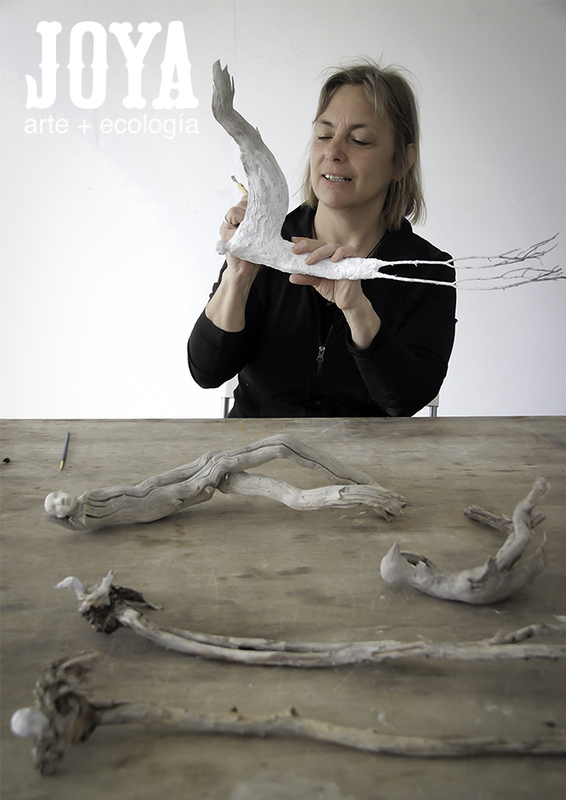 Joya: AiR is a jewel in the middle of this wild nature, allowed me to plunge into the roots of the landscape – both physically and emotionally – and allowed me to recenter myself and focus on the fundamental elements: water, air, fire, clay, all these being at first necessary but often forgotten as essential to life. Being restricted by the remoteness of the place and having to work with new materials, gave me the chance to experiment with new materials and new ways of sculpting and therefore stretch my wings”. ‘Situated in the driest region of Europe within southern Spain’s Almería province, Joya: arte + ecología lies in the Sierra de María-Los Vélez Natural Park. Characterized by moon-like plains and rocky summits, the scenic nature reserve is northeast of the Tabernas Desert, a stark geological landscape of wild badlands made famous as the filming location of classic Western films. Restored from an abandoned farmhouse complex with exquisite vision and attention-to-detail, Joya: arte + ecología thrives in a challenging yet compelling alpine desert microclimate in the rain shadow of the Sierra Larga. 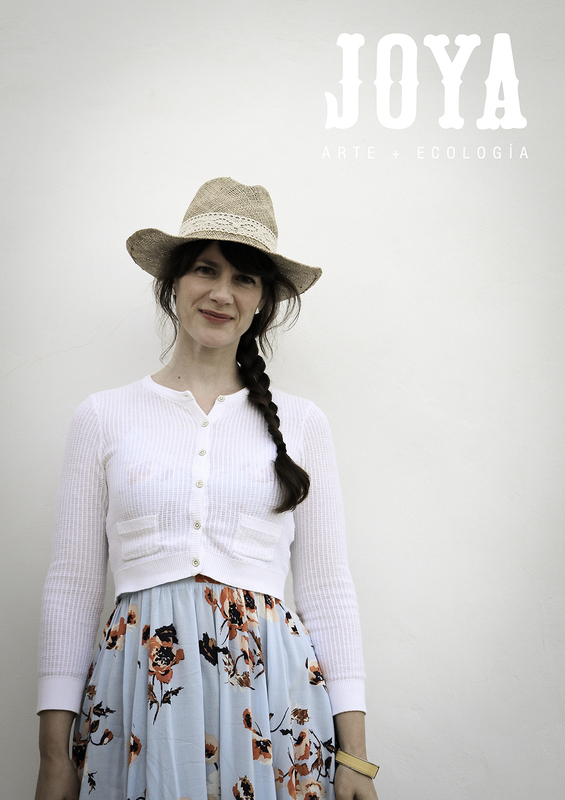 After 14 days as artist-in-residence at Joya: arte + ecología in October 2016, I came to understand the arts-led field research centre as a living artwork, a monumental life’s work created and nurtured daily by the Beckmann family: Simon and Donna, and their two teenage children, Sesamé and Solomon. Over more than a decade, the Beckmann family has evolved Joya: arte + ecología into a site-responsive residence that demonstrates a finely-tuned spatial aesthetic with inspiring sensitivity towards the natural and cultural heritage of the site. Their creation is a warmly minimalist off-grid home that sustainably functions as a habitable work of contemporary sculpture in natural congruence with the enveloping landscape and climatic conditions. Sun and wind provide electricity throughout the house, rainwater is collected from the roof, and waste is recycled through a grey water system. True to its name, Joya – Spanish for “jewel” – radiates a tremendous sense of integrity and legacy, like a gemstone revealed in the landscape by the wind and rain. During my residency at Joya: arte + ecología, I undertook a daily fieldwork practice which culminated in the site-specific installationDesert Pool (If every desert was once a sea). The project references the primeval sea that would have occupied the area millions of years prior to the current desert ecology, due to its proximity to the coast of the Mediterranean Sea within the La Hoya de Carrascal basin. Even the region’s mountains and ridges may have once rested beneath prehistoric waters as part of a primitive sea floor. Evidence of this ancient water body is readily exhibited across the desert landscape in an abundance of fossilized marine life specimens preserved in the terrain’s eroding sedimentary layers. Following Vernal Pool (2014) and Riffle Pool Riffle (2014), Desert Pool (If every desert was once a sea) is the third in a series of elemental works that reflect on water bodies as liminal spaces. Far from a stagnant form, a pool is a dynamic landscape that has retained its mystery. In each ‘pool’ I see a mythic potential, a kind of portal channeling visionary histories across millennia at the threshold of a timeless sense of equilibrium. Through this thematic concept of a ‘reflecting pool,’ immersive, site-sensitive understandings of place and time are sought. Desert Pool (If every desert was once a sea) is a light-reflective installation created in the artist studio and gallery at Joya: arte + ecología. The space features an expansive wall-sized window with a magnificent view of the landscape framed against the Aleppo pine-forested ridge of the Sierra Larga. Informed by the topography, geology, and ecology of the area, this work was executed with particular observation of the light that travels through the studio’s large architectural opening with each sunrise. The reflective aqueous surface of the wall-to-wall installation represents a kind of material recollection of an ancient long vanished sea. Referencing formative events such as the Zanclean flood – an epic breach of the Strait of Gibraltar theorized to have refilled the Mediterranean basin five million years ago – Desert Pool’s symbolic waters signal a consolidation or reckoning with the prehistoric origins of the area. I invested the first seven days of the artist residency in a daily fieldwork practice to expose the metal material selected for the installation to the desert landscape. Metal foil was chosen for its rugged yet malleable elemental properties, with the golden colour of the pure brass radiating the auric quality of the desert sunlight. The shifting autumn atmosphere consisted of cool, still mornings and hot afternoons when the wind whipped across the fields, activating the small wind turbine that provides electricity for the house, which was often the only sound heard upon commencing my solo hike each day. Three 92-metre (100-foot) lengths of heavy brass foil, 30 centimetres (12 inches) in width, were carried across the landscape from the Joya residence and repeatedly dragged down the ‘barranco’ (dry ravine) as a method of etching the material with the terrestrial textures. The barrancos of the alpine desert are deep erosional gullies in the soft mountain foothills carved by rare rainstorms. A gradual sculpting process, the barrancos were likely formed over hundreds or thousands of years by sudden floods which have historically occurred once every few years or more. A recent increase in these rain events over the last decade is thought to be an effect of climate change. The flooding rain scours the limestone, red sandstone, and domes of white clay of the mountainous slopes with a barrage of rushing water, creating deep fluvial passages that remain bone dry for much of the year during which the wind further erodes the landscape. The barranco unravels south for many kilometres, eventually widening into an expansive ‘rambla’ where it ultimately reaches the Mediterranean Sea. Each day I followed the meandering path that rainwater has travelled for hundreds or thousands of years, hiking down the barranco’s secluded and narrow passage through steep bluffs of parched limestone. As anticipated, the act of dragging great lengths of metal foil down the barranco produced a vibrational sound remarkably like rain. I led the metallic serpentine streams over giant boulders, around limestone outcrops, and across clay and sandstone deposits, recording and delineating the composition of the barranco while transmitting the rare sound of rainfall which echoed across the desert hills. The three metal pieces were left ‘in situ’ for several days to acquire a natural patina. Each day I arrived in the barranco to discover the material resting in an altered posture due to the previous evening’s lively winds, which would festively lift and twist the lengths of foil. Under the heat of the intense sun, combined with direct contact with the minerals present in the ground, the metal surface developed oxidized marks and colourful marbled stains indicative of the surroundings. A rare light rainfall seasoned the metal surface with a raindrop pattern. Pine needles that fell from low-hanging branches were similarly recorded on to the material with tarnished markings. While waiting for the process of natural patination to produce results, I created some ephemeral works in the barranco by temporarily gilding rock surfaces with gold leaf. Evidence of fossilized marine life is increasingly exposed in the barranco as the elements excavate the sedimentary layers of the ancient sea floor. A deep limestone impression of a large fossilized ammonite – a prehistoric extinct mollusc – measuring more than 30 centimetres (12 inches) across was the most extraordinary specimen, located about 40 minutes deep into the barranco. The impression was gilded by placing small torn pieces of gold leaf on to the stone surface moistened with natural spring water from the local village of Vélez-Blanco. Over a few days, the delicate gold leaf fragments were carried away by the wind, a process intended to reference the present-day impermanence of the sedimentary marine record. The water and wind that revealed the ancient ammonite imprint will also wash it away, and in time the remnants may be deposited back into the sea. Once dragged out of the barranco, back up to the residence and into the studio space, the metal foil pieces were cut and assembled as parallel latitudes across the floor similar to a large topographic relief map. Sunlight from the window illuminated and animated the installation, travelling across the room and reflecting light around the space. The light created a sensation of waves on the luminous, undulating surface, evoking imagery of a warm sea laid before the arid landscape framed in the studio window. Visible in the foreground of the large picture window is Joya’s water tank, a 6-metre-deep stone and cement cistern which must be regularly replenished with trucked-in water as no constant natural water source exists on site. Like a ribbon of time, the thin brass foil symbolizes an era when the land was inhabited by an ancient sea, a period that spanned a mere sliver relative to the geological time scale of Earth. Framing the work in this way, the mythic Desert Pool floods the interior space like a mirage in momentary symbiosis with the present. The visitor’s eye sails across the artifact’s faceted surface of gentle, glistening waves, lands at the water cistern set deep in the ground before navigating over the chalky hay fields and lastly rising up to the Sierra Larga. Resting one’s gaze high along the expansive mountain ridge crested by a rocky outcrop named Peña Casanova, the visitor is reminded that if not completely submerged by the primeval waters of long ago, the summit of this commanding landform may have stood long enough to witness a time when the desert was once a sea.